Football games, tailgates, brewery tastings, cocktail parties -- whatever you please! Save the date: 2019 Alumni Weekend April 5-7! Reunions will be held for the classes of '69, '74, '79, '94, '99, '04, '09 and '14. Whatever the occasion—chapter outings, holiday parties, alumni weekend, or class reunions—every alumni event is an opportunity to stay connected with the great big family we call Roanoke! If you live on the East Coast, there's a Roanoke chapter nearby hosting events throughout the year. 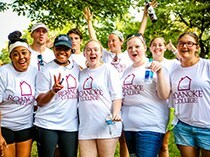 Join in, make new friends, build your professional network, and help the College, all while having the kind of fun that made your time at Roanoke time of your life. See what your chapter is doing. Remember how beautiful it was every April—flowering trees, fresh cut grass, days that went on forever? Join fellow Maroons who'll be back for a taste of Salem in spring during alumni weekend—all the fun of school, none of the pressure! Whether there's karaoke or live music, a seated banquet or an outdoor gala, every Roanoke College class reunion is a great opportunity to return to campus with classmates and friends! 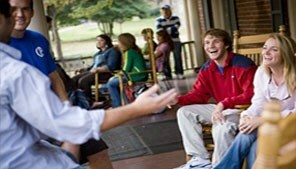 Reunions take place each year during Alumni Weekend in April.